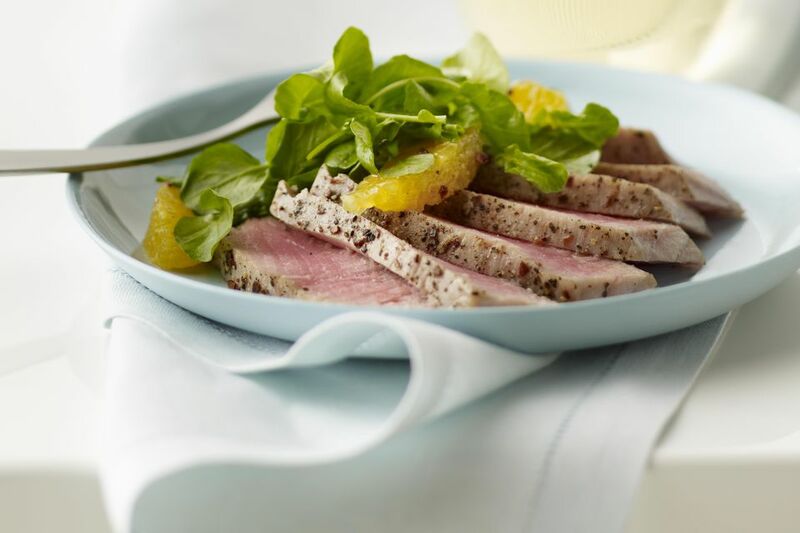 If you like steak, you will love this black pepper-crusted Ahi tuna steak recipe. This cut of tuna is best-enjoyed medium-rare, like any great steak recipe, and the spicy pepper crust is perfect with this meaty fish. In a small bowl, combine the salt, coriander, paprika, and cayenne pepper. Lay the tuna steaks out on a plate, and sprinkle the spice mixture evenly on both sides. Then coat the tuna on both sides with the black pepper, and gently press it in so that it adheres to the surface, being careful not to smash the flesh. Place a thick-bottomed frying pan, or cast iron skillet, over medium-high heat, until very hot. Add the oil, and sear the tuna steaks for about 2 minutes per side, or until desired doneness is reached.